Gardens give joy through their flowers, trees and greenery. But they can also help reduce your carbon footprint by growing fruit and vegetables, fertilised by your discarded food waste. Coupled with a modern low energy freezer, this will provide a winter’s supply of environmentally produced fresh fruit and vegetables. All sustainable gardens need a composting system, even though there is a Council garden waste collection. By recycling garden waste, the fertility of the garden can be maintained. 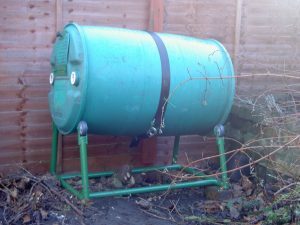 The ultimate guide to composters and composting (Scott, 2010) shows how to build your own composter and techniques for composting garden waste. A Kindle version and podcast is also available. All clippings, dead heads and leaves can be composted. Many people put lawn cuttings on the compost heap, but this reduces the fertility of the soil under the grass. By leaving the cuttings on the lawn, known as grass-cycling or mulching, they disappear in a day if the grass is cut regularly. The N, P and especially K in the clippings return to the soil to keep the lawn healthy. The only downside is that children playing on the lawn can bring the cut grass into the house on their shoes. A shoes-off policy at the door is therefore required. The lawn looks untidy until the cuttings disappear, but this is a small price to pay for a more sustainable garden. Adding food waste to the garden compost heap makes use of its nutrients and provides a compost with a higher N, P& K value than compost made from garden-only waste. Only put vegetable and fruit waste in these heaps; meat scrapings can attract rats. Food waste on an open heap looks unsightly, so pre-composting food waste on its own has merit. 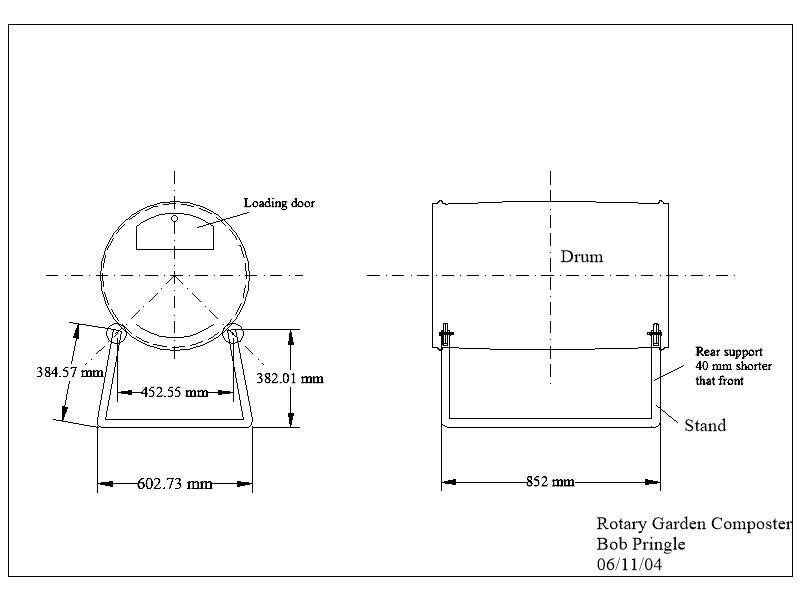 This can be carried out in a rotary composter (Figure 1), either purchased or home-made. (This design rotates with less effort than end-over-end designs). The plan (Figure 2) shows how you can make one yourself of get a blacksmith to make it for you. 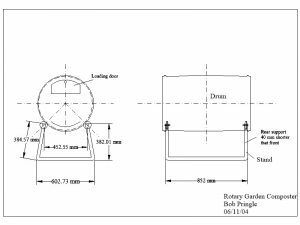 The rear supports should be 40 mm lower than those at the front, so that the waste in the drum slowly drifts to the rear, next to the exit, when the drum is rotated to empty the drum. A plastic belt with spikes on it allow you to rotate the drum. This composter is vermin proof, so meat scrapings and chicken/turkey bones used for making soup stock can be composted. To operate the composter, the food waste from your kitchen caddy is emptied from the caddy liner into the drum. If the liner is paper or biodegradable plastic it can be put in too. It is best to chop the bags up to allow them to mix better with the food waste in the drum. Once loaded, rotate the drum three revolutions for the added waste to be mixed. If the waste is too solid and does not roll easily, it is too wet. If it sounds like gravel being rotated, it is too dry. Since food waste is usually between 80 – 90 % moisture, it should not normally need any water added, except during long periods of hot weather. It can hold the waste from a family of four for 4-6 months. Every four to six months, empty 2/3rd of the contents of the drum on to the ground by rotating the drum with its exit door open. Load this material on to a wheelbarrow and turn over one of your open compost bins, adding it in alternate layers with garden compost. Break up any balls of kitchen waste that have formed in the drum as you do this. Then leave the bin to compost further for six to twelve months. You want the compost to be stabilised (i.e. no longer breaking down through microbial activity), as otherwise it will rob nutrient from the crop you are growing. Once it has a fine crumb structure, spread the compost on to your vegetable patch, fruit bushes and flower beds. Compared to peat compost from a hardware store, your compost may look ugly, with lots of twigs in it. The twigs can be separated out by sieving the compost through a 10 mm mesh. This is hard work but gives a better-looking compost. The twigs can be minimised by putting branches in the council’s bin, shredding woody material, or burning branches. While having bonfires for woody material is allowed, you can be fined if smoke is excessive and offends neighbours. Unlike the peat compost, it is sustainable and has no carbon footprint. As garden composting is a low temperature rotting process, weed seeds will still be viable. (This differs from large scale commercial composters which raise the temperature of the compost to 70 °C, which kills off seeds and any harmful diseases and pests). The garden compost is still satisfactory for planting out tomato seeds, growing tomato plants and for fertilising fruit and vegetables. The trick with planting out tomato seeds is to do this in a grid, so that the tomato seedlings can be identified from the weed seedlings by their location in the grid. In cities, towns and villages, disease and pests abound. This makes it much harder to grow organic fruit and vegetables than if you live in the country. One recourse is to give up trying to grow organically and use sprays when disease or pests strike. 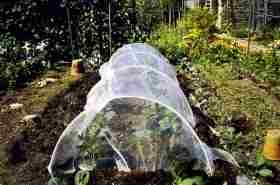 The better alternative is to use netting to prevent pests getting access to your produce. For small insects like carrot root fly and aphids, Enviromesh or fleece is most effective (Figure 3). I use slug pellets to prevent carrot seedlings being eaten by slugs, but after that the carrots grow free from root fly so long as they are grown in a rotation. Without the netting I get no edible carrots. While I do not grow brassicas, 7 x 7 mm netting to prevent large white butterflies landing on the crop seems to work well. People usually build a cage so that the netting does not need to be draped over the cabbages, Brussel sprouts, cauliflowers or turnips. I have tried to use Enviromesh to keep aphids off black currents and sawfly off gooseberries, but timing is critical as pollinators need access to set the fruit. The aphids on black currents deposit honeydew which can subsequently result in mildew forming on its leaves. This approach has failed, as timing is everything and holidays or weekends away make this impractical. Last year for the first time I gave up using soapy water to deter sawfly and used a Lambda-Cyhalothrin micro-emulsion spray instead. The results were excellent, but the organic aspect was lost. Much garden produce goes to waste due to poor storage. The best place to store root vegetables like carrots, parsnips, turnips, is to leave them in the ground and only dig them up when you need them. If prolonged freezing weather is forecast, they can be covered with straw with a plastic sheet on top. Potatoes can be left in the ground till November or until the ground freezes. If the soil is likely to freeze they should be lifted, allowed to dry off and become dormant over a week, then put them into Kraft paper bags in a cellar or garage to keep them both cool and in the dark. Depending on the temperature and variety, they should keep in the UK without sprouting till between January to March. Plums, black-currents, raspberries, gooseberries are best put in the freezer. Apples are difficult to store in garden sheds or cellars as they suffer from condensation when warm fronts pass over. This leads to rotting. For best results, pick the fruit off the tree so that they are not bruised. This also prevents wasp or slug damage that occurs on fallen fruit, which allows rotting to start. Wrapping the apples individually in newspaper and storing the apples in boxes will help keep condensation off the apple skins and reduce rotting. Another approach is to store apples one deep on trays, stalk uppermost and not touching. Remove any rotting apple immediately, so that it does not inducing rotting in its neighbours.